Super Bowl Sunday has become an unofficial American holiday. But let’s go back 80 years to pro football’s early days. Things were a lot different then, when the National Football League staged its first championship playoff. In 1932 pro football was still a poor cousin to the college sport. The NFL was barely surviving with eight teams. When the regular season ended, two teams had tied for first place: the Chicago Bears and the Portsmouth Spartans. The NFL had never had a first-place tie. A special playoff game was hastily arranged. The two teams were scheduled to meet at the Bears’ Wrigley Field home on December 18th, a Sunday afternoon. As game day approached, Chicago turned cold. The Sunday temperature forecast was for a high of 15 degrees. Since pro games only drew a few thousand people in the best weather, league officials were afraid nobody would show up for their championship. Their solution was to play indoors. 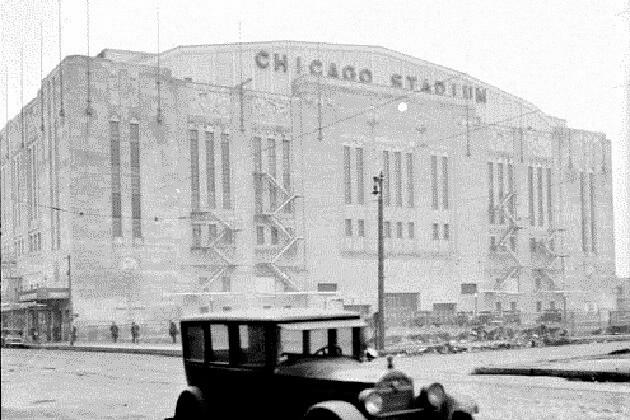 The game was moved to the Chicago Stadium and rescheduled for 8:15 in the evening. Though the stadium’s floor could be covered with dirt, one problem remained – there wasn’t enough room for a standard football field. That meant the rules had to be adjusted. Since the field was only 60 yards long (instead of 100), every time a team crossed midfield, the ball was spotted back 20 yards. The grandstand walls were flush against the sidelines, so each play had to start away from them, near the center of the field. The end zones were only a few feet deep, so the goal posts were moved up to the goal line. The game was played with little difficulty. A near-capacity crowd of 11,193 came out–or rather, came in. The Bears won, 9-0. The 1932 playoff turned out to be a milestone. The NFL discovered that some of the temporary rules made for a more action-packed game, so those rules became permanent. The league itself was divided into two conferences. Now each season would climax with the excitement of a championship game. As for the Portsmouth Spartans, they played one more season in the NFL. 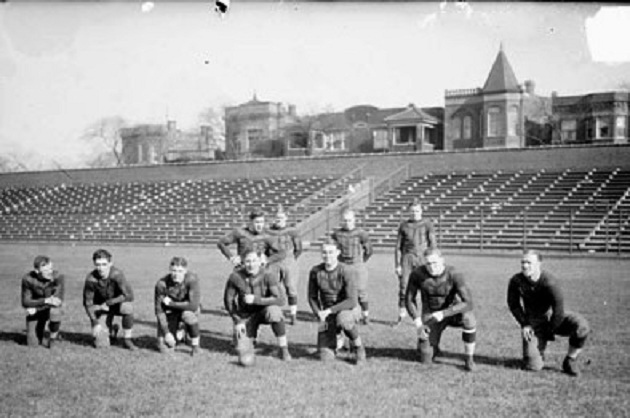 In 1934 the team moved to Detroit and became the Lions.